Cover Love includes a cover, blurb, buy links, and social media contacts for the author. 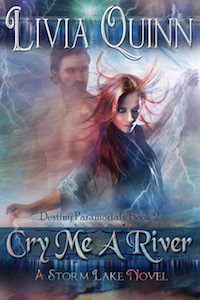 Today's featured book is Cry Me a River by Livia Quinn. My name is Tempest Pomeroy. For nineteen years I denied my heritage, until my brother’s genie bottle went missing. Time is running out for River, and the attraction that was growing between me and Sheriff Jack Lang derailed after a series of shocks sent us both reeling, and he got his first glimpse of my Paramortal “talents” - a few measly bolts of lightning aimed at his—in his general direction. In the course of the investigation we’ve gonr from attraction to suspicion, support to friendship, romance to oh-my-god-get-away-from-me revulsion. Jack’s an ex-Navy pilot. He says he wants to know “everything”. My ex-lover, but after we answer Jack’s questions, he’ll either join us, or grab his daughter and take the first jet out of Middle Earth. He might help me save my brother and discover the whereabouts of my parents, but he probably won’t still want to take me to the Mardi Gras ball, once he knows “everything”. There’s a lot of everything. Hi, I’m Livia Quinn, a DC native living on the bayou. With a life long fascination (read that: phobia) of storms, and living in Louisiana where severe weather is a part of life, it was only natural that it would play a big part in my world. My former jobs as a mail lady, computer trainer, plant manager, professional singer, business owner and salesperson have stocked my brain full of quirky characters and I can’t wait to share them with my readers. Traveling this week but just wanted to say thanks for hosting Cry Me a River today. It's one of my favorite books.